This particular nail art design has been on my list for a very (very) long time now. As I was deciding what I should paint on my nails, I was reminded of Pon and Zi. Are you a fan? I am, since the day a friend introduced me to these emo cartoon characters conceptualized and illustrated by Jeff Thomas. I truly enjoyed freehand painting Pon and Zi into my nails. As a cartoonist/artist, I could only dream of being able to create characters such as Pon and Zi. They appear so simple yet they have this unique charm that never fails to warm the heart ... at least mine. Base color is 3 coats of Tony Moly GT02. It's a glitter polish that imitates a midnight blue shade. I wore this for a day as it is until I decided what nail art I wanted to go with it. Yes, sometimes, I do wear nail polish as is until I get inspired for a nail design. This is also true whenever I want to enjoy a shade for awhile. I used acrylic paint and a detailing nail art brush to create the 2 characters. I painted the characters on each of my ring fingernail that served as accent nails. I wanted Pon and Zi to standout in this nail design so I thought of painting hearts on the other nails since their story is really about love. But instead of hand painting the hearts, I decided to use one of my stamping image plates. Yes, it has been quite a long time since the last time I did some stamping. I used Konad m59 image plate and China Glaze 2030 for stamping. I figured the gold color and image design is subtle enough not to drown the 2 cartoon characters. 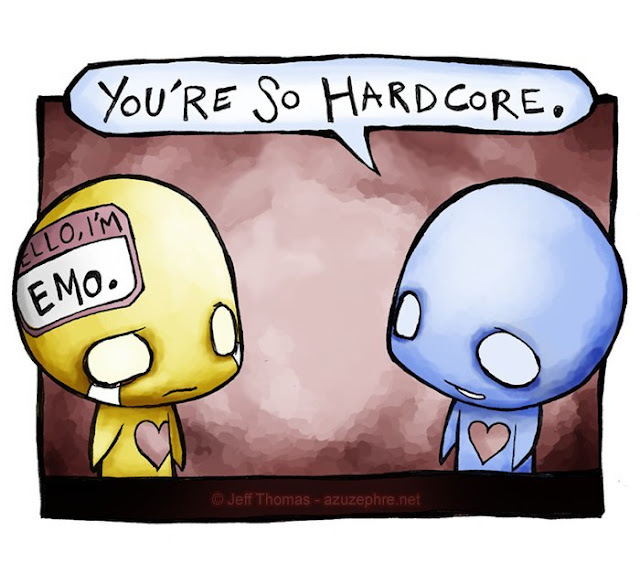 Pon and Zi can only be differentiated by their color. Jeff Thomas explained that he really didn't designate any gender on these 2 emo characters simple because both female and male readers can actually relate to either of them. When I first saw these characters, I was immediately taken. They look so simple to draw yet their charisma is unique. I even thought they look like small aliens. But it is amazing how the artist is able to create emotions out of simple geometric shapes. I added a few shadings on Pon and Zi as I wanted to imitate how they are normally illustrated. If you look closely too, I actually painted outlines regardless of the dark background. The outlines may not be standing out but they are visible to the naked eye and the design looks better with the black outlines. I was thinking of painting several Pon personas on one hand and Zi on the other. I think that would be amazing. Perhaps when I get a chance to have a longer nail art session with myself. adorable! Now I finally know where they came from and what's their name. :)) Cute! oh my gosh.. you're so talented. I love this. Amei a nail art, ficou perfeita. Pena que me falta cordenação motora suficiente pra tentar fazer igual, haha. These are very nice! Do you have a nail art salon, how about here in Manila? Tnx!